Full of historical buildings and many major landmarks, much of Salamanca has been shaped by wealthy families and businessmen over the years. 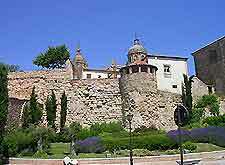 With a rich Roman heritage, the ancient remains of Salamanca's City Walls (Las Murallas) have become one of the area's most significant ancient landmarks. 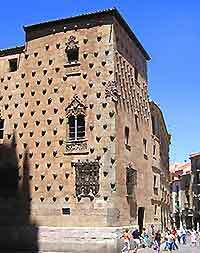 Worthy of a visit, further landmarks in Salamanca include the Casa de Álvarez Abarca mansion, the Palacio Rodriguez de Figueroa and the Casa de las Conchas - famous for its façade, which is covered in sea shells. Known for its magnificent Gothic-style architecture, the Casa de las Conchas is close to the central Plaza Mayor. With sea shells embedded on the exterior walls and many historical features, this grand house was built at the end of the 13th century and now houses a library, an art gallery, tourism bureau and function rooms. One of Salamanca's most impressive landmarks, the Casa de Álvarez Abarca is a striking mansion which was once part of the wealthy Alvarez Abarca family. Highlights here include the Museum of Fine Arts, many architectural features, a small tower offering impressive views and landscaped gardens. Salamanca's Las Murallas are an important reminder of the city's Roman past and can be found in the Barrio Antiguo area of the city. Built as a major defence strategy, a further wall was constructed in the 12th century, although only a few small sections of each wall now remain. 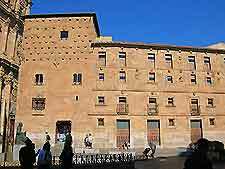 The Casa de Santa Teresa de Jesús is an important 16th-century residence, located in the very centre of Salamanca. Although the architecture is fairly insignificant, the building is of great local importance as it was once the home of famous local nun Santa Teresa de Jesús. The Palacio Rodriguez de Figueroa is one of Salamanca's many impressive 16th-century treasures and features elaborate décor, both inside and out. Now home to the exclusive Salamanca Casino, the Palacio Rodriguez de Figueroa contains an array of gaming tables, together with seasonal exhibitions and spacious function rooms.